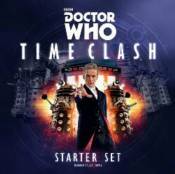 n Doctor Who: Time Clash, the Doctor and the Daleks are locked in a desperate struggle for the fate of the universe itself. You�ll play cards representing plans, threats, tech, and quips to stacks that represent the time of the struggle, the Doctor�s companion, and the enemy�s influence. The two sides also compete to control the Doctor�s location, which activates or deactivates crucial powers. During the game�s build-up segment, each side tries to establish an advantage. When the balance tips and the endgame comes, they press for victory. Either one of the Doctor�s desperate gambits will succeed, or the Daleks� pressing threats will crush him!